Our Terms and Conditions allow the online Lesson Plan and Worksheets to be used for immediate family use or with an active License ONLY. Thank you for your honesty. Almost every preschool website contains its own version of tracing worksheets. Almost every dollar store and superstore has for sale a "letter workbook." And because of this, many have the idea that this is the method kids should use to learn to write their letters and numbers. But, if you have ever tried this approach, you know it can be frustrating for everyone involved. While working with our son's therapist, I learned a lot about teaching our kiddos how to write their letters and numbers. I learned that the key is in the process and that each level is a building block for the next level . In this method, tracing worksheets are not used until after the child has learned the proper formation of the letters and numbers. 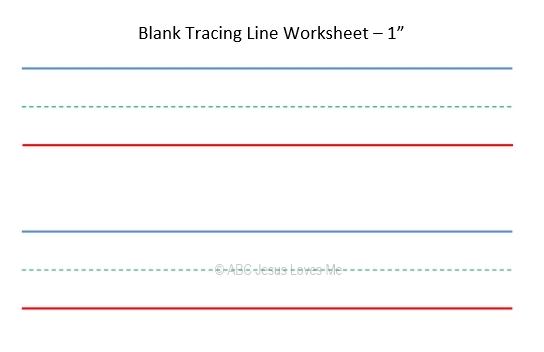 And even then, I had to discover the "perfect" tracing worksheets. Beginning writers need larger letters and thicker lines to learn how to correctly form letters and numbers. Adding start and stop dots along with spacial boxes guides a child through this process. Combining this sequence with the Letter Formation Chants and Number Rhymes will help your child succeed! The ABCJLM Handwriting Process involves five steps. Each of these steps are developed in the ABCJLM Curriculum. See more tips by scrolling to the bottom of this page. Handwriting is one of those topics that creates an array of emotions. Even professionals don't agree on the procedure of teaching and practicing. Add in the vast difference of development among children the same age and what a mess we all face. No matter which side of the fence you live on there are two absolutes. The process of teaching handwriting should not be a negative experience for a child. Secondly, the personality and development of the individual child needs to always be forefront. No matter what other children the same age are doing, remember the child before you is unique and special. 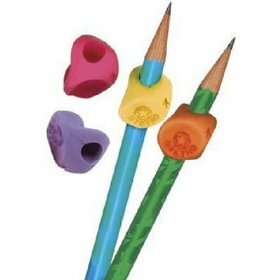 There are several pencil grip stages of development before the child masters the three-finger grasp that we all think of. Time and progress in the child's fine and gross motor coordination will automatically move the child through these stages. Half way through the 2 Year Curriculum, activities are provided to help the child hold a pencil correctly. IMPORTANT: At this point in a child's life, some children will not be ready for this activity and that is okay. Be careful not to frustrate the child while doing this activity. 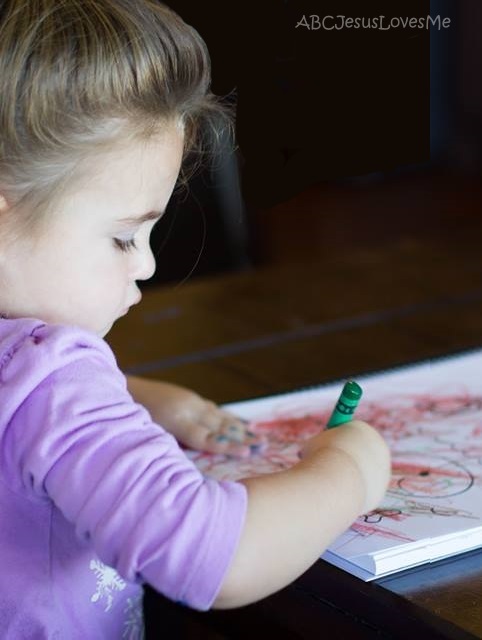 No matter how much you work with the child, if the fine and gross motor skills are not at the level they should be, your child will not be able to properly hold a pencil. If this is the case, continue to work on fine motor activities (small muscle movement like in the fingers) and gross motor activities (core strength) to increase the child's motor control. When the child is ready, teach the child to hold the writing utensil with his/her thumb and index finger while supporting it on the middle finger. I tell the child to make an alligator mouth with his thumb and index finger to pinch the pencil. Then the alligator goes to sleep and rests the pencil on the middle finger. 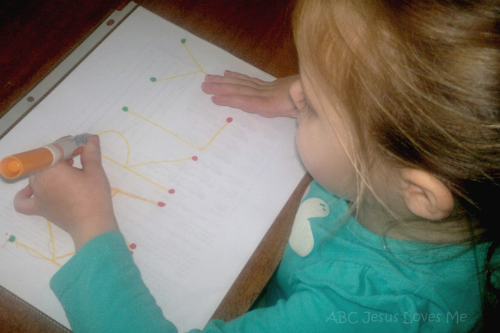 Lori, on our ABC Jesus Loves Me Facebook Group shared this similar idea, "Lay a pencil in front of the child with the point facing toward her. Ask her to pinch it with her thumb and forefinger about 1/2-3/4" from the end. Pick it up and flip the pencil back onto her hand. Support the underside of the pencil with the middle finger." Both of these techniques work with right and left-handed children. Short pencils and broken crayons are best to start with if the child does not use proper grasp. Click for tips on teaching a child how to correctly hold a pencil. 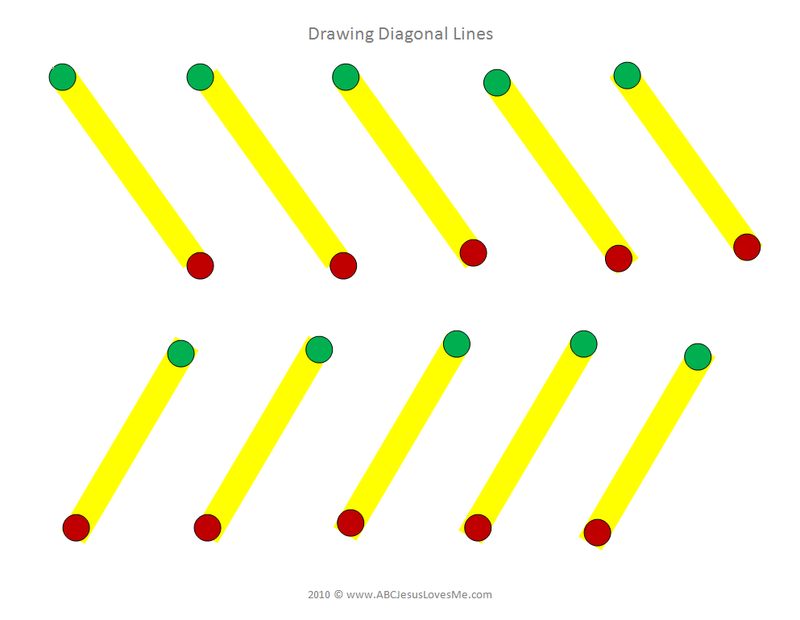 Since all letters and numbers are made of five simple movements, a child must first be able to hold a pencil and follow a straight, diagonal, or circular line. This pre-writing is introduced in the last few weeks of the 2 Year Curriculum and reviewed in the 3 Year. 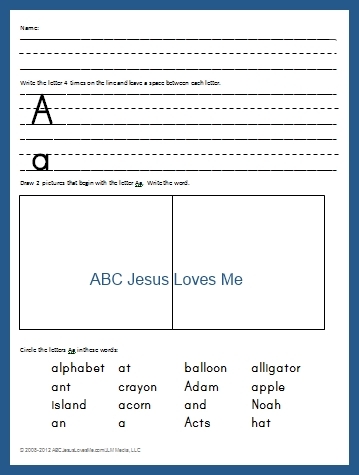 To begin teaching this process, the ABCJLM Handwriting Curriculum includes worksheets with 3" vertical lines. 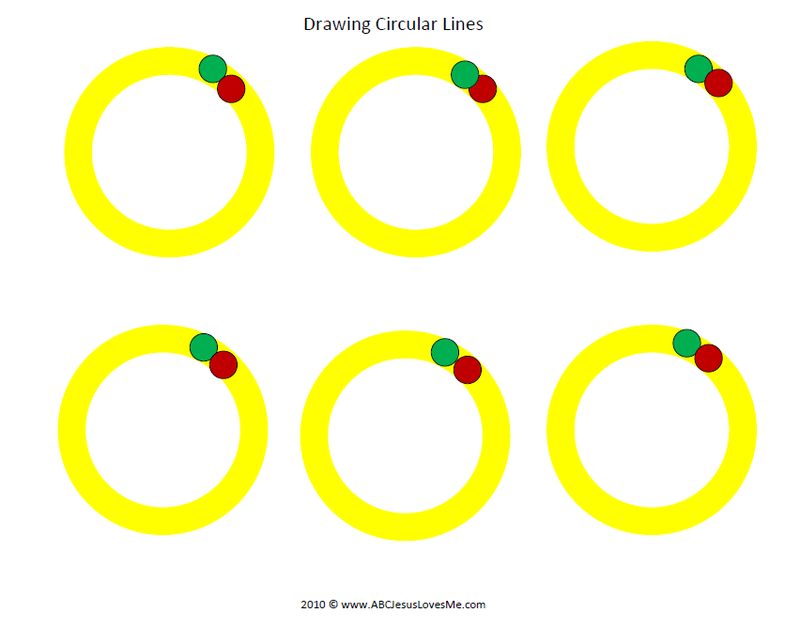 Then as the child is ready, he/she is introduced to horizontal, diagonal, and circles. Green dots are provided for "go" and red dots for "stop.". Help the child place her pencil on the green dot, draw along the yellow, and stop at the red dot. The Pre-Writing Worksheets are available to order in the 2 or 3 Year Workbooks or in the Handwriting Workbook. Upon mastered the basic lines and circles, the child is ready to begin Step #3. 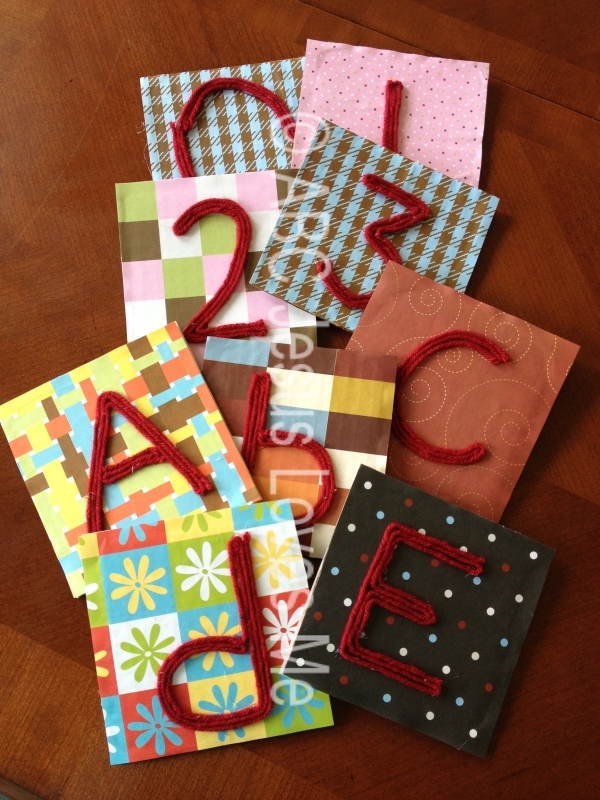 This portion of the process can be done using tactile and/or written letters and numbers. The purpose of this step is for the child to learn the correct formation . Tactile letters and numbers are part of the 3 Year Curriculum and are a multi-sensory way of the child learning letters and numbers: sight - the child sees the letter, touch - the child forms the letter on the textured form, hear - the child says the name of the letter while tracing it. In writing, use a thick yellow marker or highlighter to draw 3" tall letters or numbers across a horizontal paper. Begin with just one character per page at a time. Add a green dot at the starting point of each character and a red dot at the finishing point. Most letters have more than one starting and ending point. Only draw the first starting and ending point. Once the formation is mastered, take away the yellow line, red dot and then finally the green dot. Progress to smaller and thinner lines. Be sure to say the Letter Formation Chants and Number Rhymes as you form the characters. These will assist the child and help him remember the correct formation. The first half of the 3 Year Curriculum focuses on the child only tracing tactile letters and number with her index finger. In the Week 20 Lesson Plan, the child slowly begins to write her name using capital letters only. Follow Step #3 to aid in this process. The 3" Letters are available to order in the 3 Year Workbooks or in the Handwriting Workbook.. 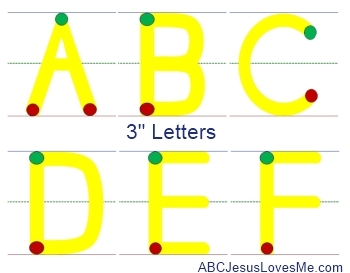 While these are not used in any of the curriculum, many have asked for the 3" Lowercase letters as well. This printable is available to order as a digital download. - For children who desire to write but are unable to do the 3" letters and numbers due to lack of fine motor skill, use the Letter Posters and Number Posters to teach the correct formation. 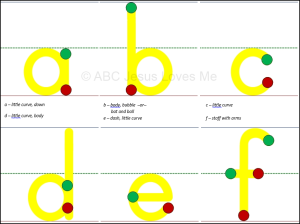 Add green and red dots to the posters and teach the formation using the Letter Formation Chants and Number Rhymes . Encourage the child to stay between the lines when forming each. Links to print ABCJLM Letter and Number Posters are available in the 3 Year Curriculum Lesson Plans . The Letter and Number Posters are also available to order in the 3 Year Workbook. 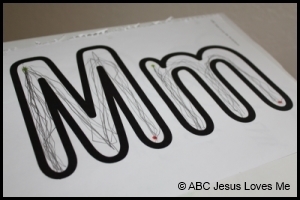 Once the child is able to correctly form the 3" characters with the green starting dot, place the characters on the classic tracing lines. Now the child is ready to practice keeping the letters and numbers uniform. Almost every number and letter in the alphabet is similar to another letter or number. The Letter and Number Progression worksheets of the 4 Year Curriculum combine these similarities to make handwriting easier. 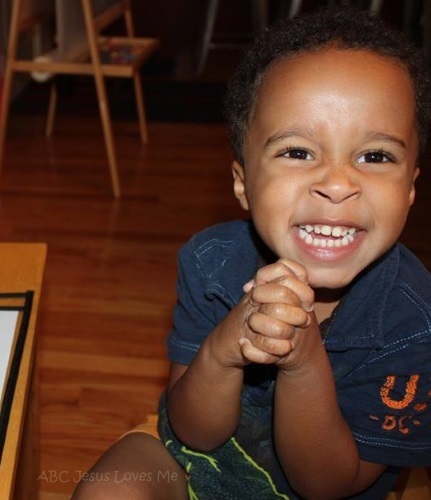 Beginning with the simple line and progressing to more difficult strokes, the worksheets increase in difficulty allowing the child to ease into the harder forming letter and numbers. Letter Formation Chants and Number Rhymes have been written on each of the worksheets to help the child learn how to correctly form each. As my kiddos write their letters and numbers, I say the chants along with them. I have color-coded the lines to help in the formation. The middle line is green since many lower case letters start (go) on the middle line and end on the bottom (red) line. The top line is blue (sky). 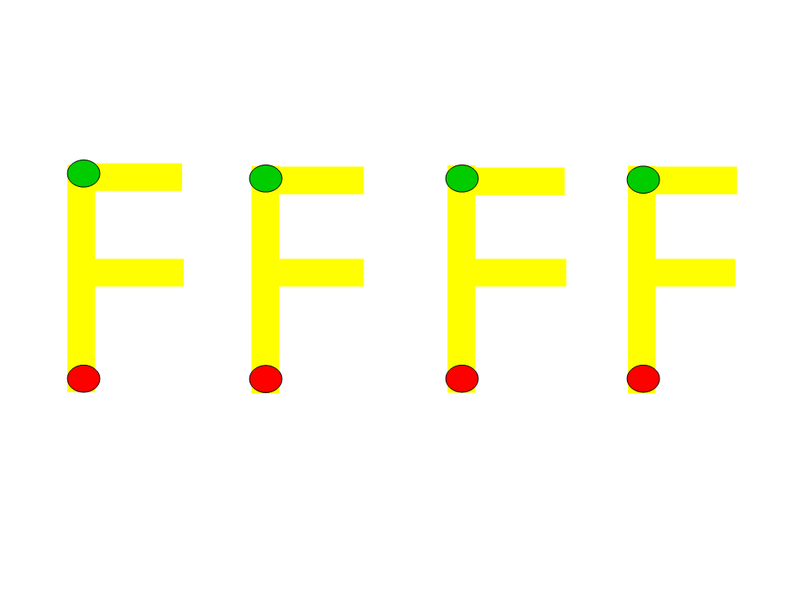 Draw the characters in yellow with the added the green and red dots for each letter and number. To finalize this step, take away the yellow line first, red dot second, and finally the green dot when the child is ready. The ABCJLM Letter and Number Progression Worksheets are available in the 4 Year Workbook or in the Handwriting Workbook. Step #5 places all of the letters and numbers in alphabetic and numeric order and begin placing the letters into words . These Writing Worksheets - adapted from Mrs. E - in the 5 Year Curriculum practice correctly writing the letter, drawing words that begin with the letter, and finding the letter in words. These worksheets are available to print in the 5 Year Curriculum Lesson Plans or purchase in the 5 Year Workbook and Handwriting Workbook. These worksheets use the same setup as the Letter and Number Progressions Worksheets with blue, green, and red lines. Start with the wider lines and progress to the small lines. These worksheets are available in the 5 Year Workbook or in the Handwriting Workbook. **If you have trouble getting all of the lines to print in color, please print while using the free Firefox browser as IE and Chrome do not always work correctly. Stetro Grips are very good to enforce a good pencil grasp when writing. Dry Erase Pockets help save paper as the child is learning to write. Place the worksheet in the pocket and use a dry erase or vis-a-vis pens to reuse each worksheet. Click for more handwriting suggestions.